As we grow up, there are certain things that we’ll more than likely have to do. One of these things is attending a job interview and dressing for success can be hugely stressful. Getting it absolutely right is key to making a good first impression. Regardless of what job your interview is for, you always want to portray the absolute best version of yourself. Whether it’s a new outfit, fresh haircut or beautifully manicured nails, looking good is a definite. In a study by the National Association of Colleges and Employers, 73% of hiring managers said an interviewees grooming habits had a strong influence on their opinion of them and 49% also said interview attire was influential too. But not only will looking good be a huge positive when attending an interview, it will make you feel good too. Regardless of the current shoe trends, your shoes should be professional and understated, unless the position you’ve applied for is in the fashion industry, in which case focus on current trends may help. 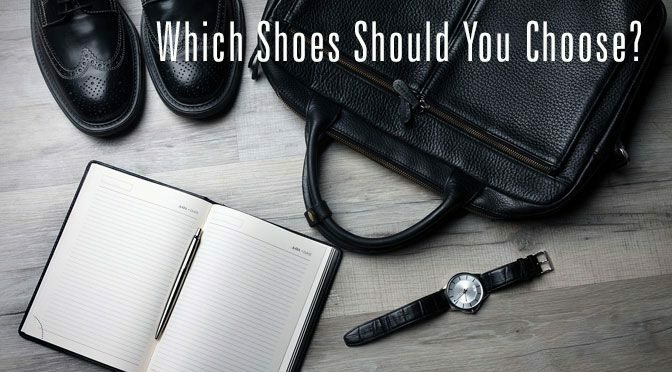 Here we’re going to take a look at the best styles of shoes for interviews for both men and women, what will work best for you as well as promote a professional image. Which Shoes Are Appropriate For Interviews? Potential employers will expect interviewees to look their best. This is especially true of corporate positions or those that are customer facing such as sales roles. With that in mind, it’s important to make the right decision when it comes to the footwear you choose. You may want to mirror what you’ve seen other employees wearing, however, you should avoid this and always choose as conservatively as possible. This would mean no trainers, flip flops or over the top heels. You might want to wear flat shoes to an interview, this would be absolutely fine but a formal, structured pair would be suggested. An unstructured, patterned pair would be too casual for an official interview. Lace-up women’s brogues are a formal yet comfortable alternative to ballerina flats, they are also a good choice in the winter months when you don’t want to wear boots. Brogues are also a smart choice for men, as well as Oxford shoes if you prefer an even simpler design. On the flip side of this, during the summer months, you may be tempted to wear an open toe shoe or sandal. While they may be smart we would advise against them, not everyone will consider them business attire and they may not meet your potential employer’s expectations. They may also pose a health and safety risk if interviewed in an environment where there is potential for injury. We would also advise avoiding very high heels particularly stilettos. Much like unstructured flats they can affect how you walk and if they’re to be worn for a prolonged period of time, they can become painful. Consider a heel no higher than 3 inches to maintain comfort, a block heel or a wedge will be the most supportive for your feet. When choosing the colour and finish of your shoes, it’s best to stick with the most neutral colours such as black, dark brown or navy. Wearing light brown shoes to an interview can be seen as informal. Bright colours and patterns can also be distracting, as can certain decorative accents such as buckles, rhinestones, sequins and bows. Keeping them as simple as possible so as not to draw attention away from you personally, is the key. Black patent leather shoes can look very smart depending on the the style you go for. The condition of the shoes you choose is just as important as the colour and style. If the tops, toes, heel or outsoles appear to be noticeably worn, select a different pair. Ensure they’re also clean with any dirt removed and scuff free. 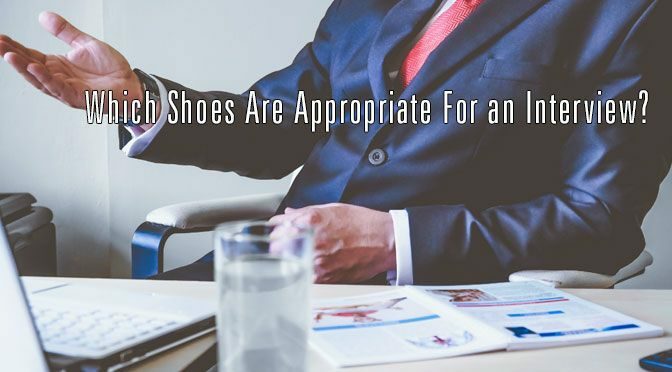 Though it may seem contradictory, we wouldn’t recommend wearing brand new shoes to an interview either, new shoes can cause blisters or pain which may prove to be a distraction for you. So Which Shoes Should I Choose? The Outfit – If you’re wearing a suit to your interview, the focus should be on the smart tailoring and structured nature of the suit. With that in mind, your shoes should be the same. A solid, yet simple pair of shoes that match the colour of your suit would be perfect. The Job – Knowing what is likely to be expected of you in terms of appearance, largely comes down to the type of job you’ve applied for. A customer facing sales role would likely have a much more strict dress code than, let’s say, a mechanical engineer. Though you should always do your best to look smart for your interview, you also have to think practically… Will you have to demonstrate your abilities? Will you need to change into protective clothing or footwear? The Seasons – The weather should always be taken into account when selecting shoes for your interview. Cold, wet or even snowy weather may call for a more substantial sole with a smaller heel and a full upper. You may also opt to try out smart boots to avoid getting wet feet. Patent leather shoes or suede shoes should be avoided in wet weather as they will stain and mark easily. 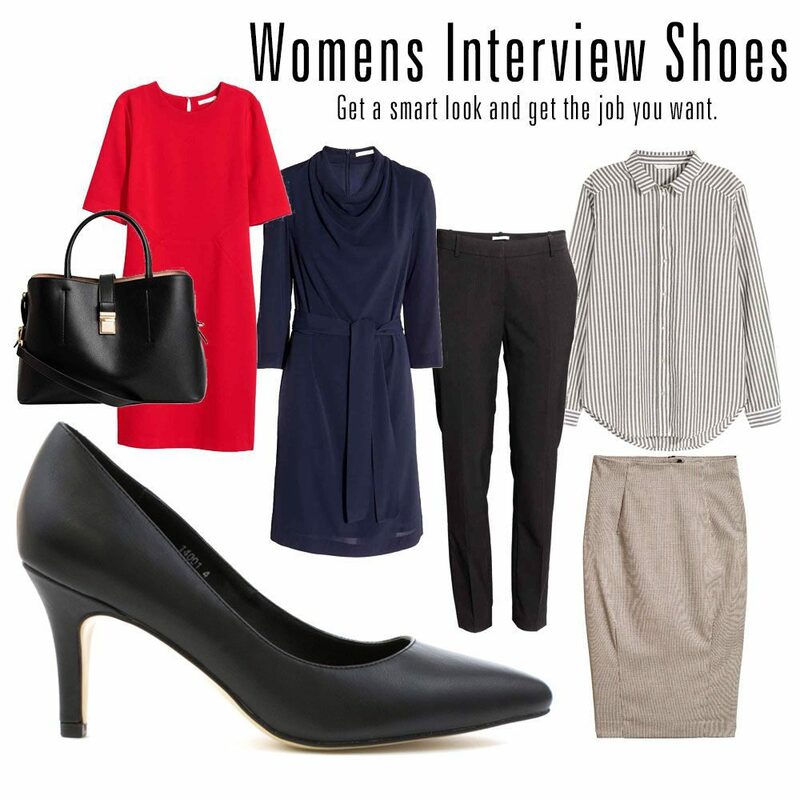 For us, the best shoes for an interview would be structured, simple and practical. A well kept and clean pair of shoes will create a good first impression. Lace ups – Simple and classy, men’s lace-up shoes are available with either a round or square toe. Also known as an Oxford. A traditional Oxford is usually made from smooth layer and can be either plain or patent. Mens Oxford shoes usually have a heel height of around 1 inch. Brogues – Much like the lace-up, men’s brogues are more design lead with a specific perforation patterning along seams and a wingtip to the toe. Brogues would usually have open lacing, as opposed to the closed lacing of the Oxford. Court Shoes – A simple shoe with a low cut front and no fastening, they are usually made from soft structured leather with closed toe and wide heel. Usually a mid or kitten height heel is the most professional court shoe. Court shoes with an ankle strap are known as Mary Janes. Brogues – Much like men’s brogues, they’re more design led with patterning to the toe and heel. Most women’s brogues have closed laces to provide a more feminine look. They’re also available in a variety of heel heights to suit your preferences. 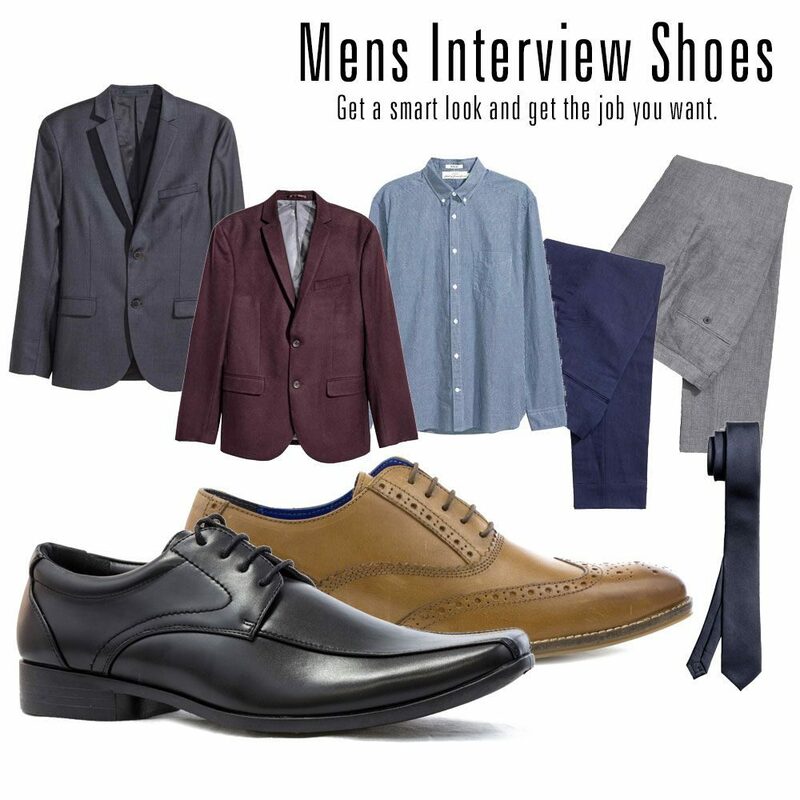 Choosing the right shoes for an interview might seem daunting, but keeping things simple, practical and clean should serve you well. Once your outfit is sorted and you feel good, there’s no reason why you can’t take on the world! Your shoes play a very important role in an interview as they show what kind of a person you are and how well you are carrying yourself. 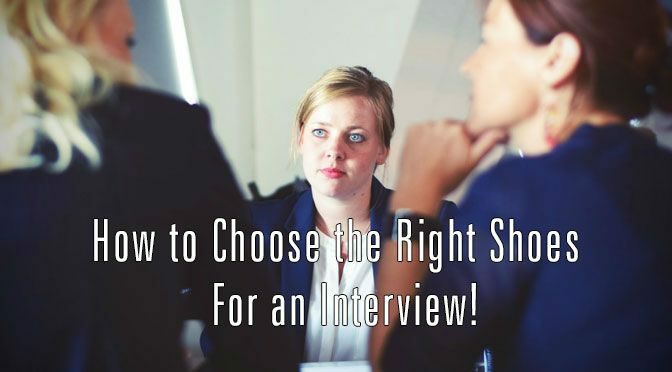 Great ideas for choose the right shoes for an interview….